One of the places I have camped the most since I’ve moved out east is Meadowbrook, situated right between Saranac Lake and Lake Placid in the Adirondack mountains. I’ve probably stayed there a dozen times over the years and although it is hardly the nicest place to camp – situated right off the highway beside a BBQ restaurant and a car dealership – it is comfortable and within the small campground there are a few really nice sites. This year for Fathers Day we were able to snag my favourite site, #26, a huge site in deep trees at the terminus of the campground road. We drove down with H’s brother, while her sister and parents arrived in different vehicles bound for their own accommodations. We pitched our new tentropolis, which is the size of a small apartment and settled in to relax on the Friday night with perfect weather. On Saturday morning, after a lazy start we headed out to climb Haystack Mountain. This is a relatively easy and short climb (even for kids) just outside of Saranac Lake that has a pretty good payoff in terms of the view from the top. After our hike we went just north of Saranac Lake to Lake Clear to cool off. This mountain lake was still pretty chilly for swimming but with the heat it didn’t take long for us all to get in. For dinner on Saturday we went in to Lake Placid to eat on the main strip at H’s parents’ favourite spot, The Dancing Bears, and afterward we enjoyed a nice walk along Mirror Lake with the beautiful weather. We capped the night off with another great campfire at our site. After taking down the site on Sunday, we stopped in Saranac Lake for ice cream and also to check out the restored Adirondack Carousel – something I’ve meant to do for years when we’ve visited but thought we better get done this time before our kids were too old to ride. It was another great weekend in Lake Placid – so I’m sure we will be back again soon. Typically when we travel I will find a place I think we’d like to stay and then worry about flights et al. afterward. When considering Mexico, there seemed to be plenty of options so we booked flights that worked and then went from there. We already knew that we weren’t going to consider resorts but I was amazed by the multitude of options available on Airbnb. There were all sorts of different options in the peninsula that we considered but after choosing Tulum, we quickly settled on this newly built two bedroom condo. It was central to the town and the beach and since we knew we’d have a car, it was a great option. Although the pool wasn’t heated, the warm weather was enough to make it pleasant and our kids seem impervious to any temperature of water regardless. The roof deck made the place as we spent many mornings up there having our coffee. In Akumal, the place we stayed worked out well as we only needed it for three nights rather than a whole week. Attached to the massive Bahia Principe resort, these condos had access to the amenities of the resort but also had their own beautiful pool and facilities that we found less crowded and even nicer. The condo itself was beautiful and was a great deal. I am not sure how the economics of buying a place like this works for the price they were renting for but it worked out well for us! For an easy vacation of just relaxing by the pool and enjoying the sun, this would be a great spot. My full Airbnb wish list is here. Based on the selection, it is clear we still have lots of exploring to do in the area. Who could possibly give up the opportunity to sleep in a train caboose? In planning her trip, my mom had come across the Train Station Inn and suggested that it might be quite a hit for our kids as we left Prince Edward Island. To call it a hit would be underselling it; I am pretty sure they would still be there if they could be and they weren’t the only ones that were impressed with this unique accommodation. The Train Station Inn is a collection of cabooses and train cars that have been renovated into unique hotel rooms and located on the tracks surrounding the century-old Tatamagouche train station. The Inn opened up in 1989 and has been chosen before as the most unique place to stay in Canada. We stayed in Caboose #9 – a two-bedroom caboose with 2 conductor seats in the cupola where the kids spent most of their time. It also featured a private deck on the back and somehow also had a shower and bathroom squished in there. I don’t believe the caboose had the deck while in service. We also enjoyed breakfast in the train station the next morning and exploring the small town of Tatamagouche, complete with excellent bakery and their own microbrewery Although we were only in Tatamagouche for one night, the caboose accommodation provided a memorable experience that I would certainly recommend. 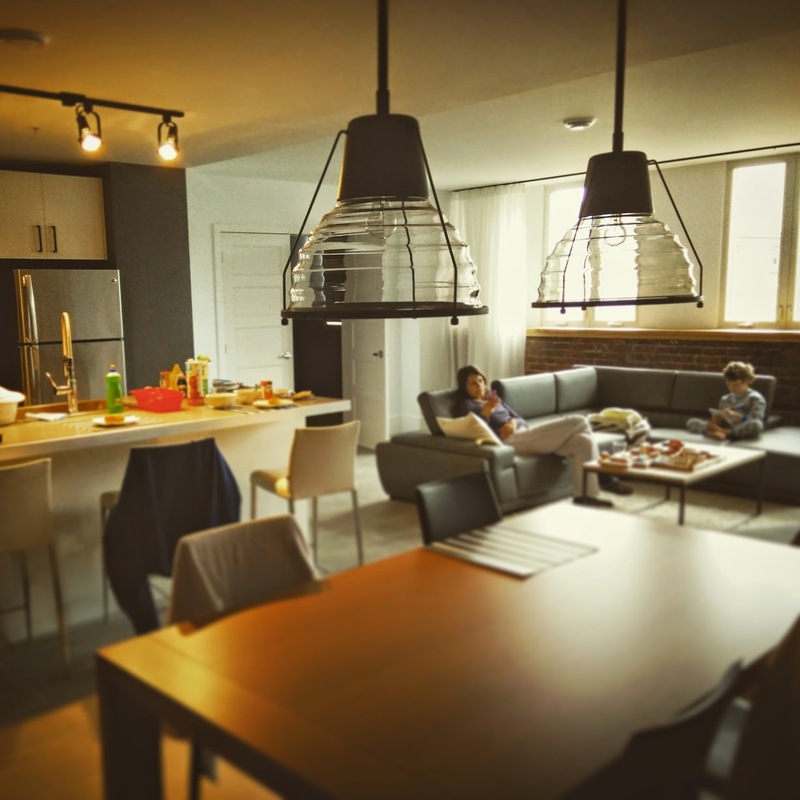 Last weekend we were in Quebec City for three nights and stayed at the recently opened Les Lofts St-Joseph. This boutique property consists of 18 two-bedroom lofts that were created as a part of a massive renovation in a building from 1918. The property just opened at the beginning of April and we were actually the first guests to stay in our unit. This would also explain why I was unable to find reviews before we stayed but our leap of faith was rewarded with an awesome place. Les Lofts are another step in the revitilization of the Saint-Roch neighbourhood in Quebec City. This reminds me of a sort of ‘Williamsburg lite’ – right down to the Urban Outfitters that has just opened up. Although not how most people picture Quebec City, we found that it was much more authentic and enjoyable than staying in the Old City where it tends to be dominated by tourist traffic. There are plenty of cool coffee shops, a couple of microbreweries – including La Barberie which makes a pretty tasty IPA. We were still able to hike up the hill into the old city and take in the beautiful sights there as well. As the pictures on their website show, this new place is beautiful with lots of natural light and they have thought of almost everything in stocking the apartments. We would definitely stay in this same spot when returning to Quebec. Months ago, when we decided that we would be heading back to Alberta for Christmas, H and I thought it would be fun to do something with her family before the holiday. 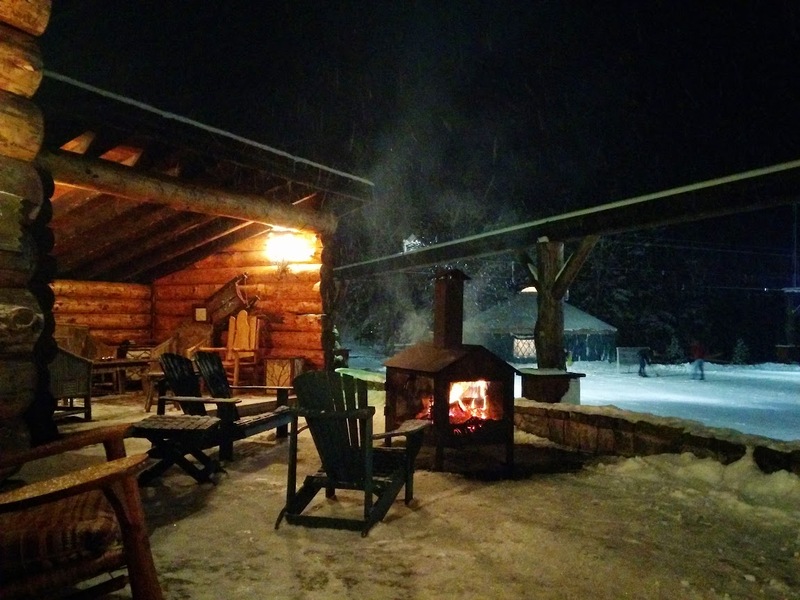 When poking around on Travelpony, I had found a great deal on the Whiteface Lodge and we quickly signed everyone up. A side note, if you haven’t tried Travelpony out yet, I’d recommend trying it for your next hotel stay – in some cases, they have amazing deals and a good cancellation policy as well although your stay is prepaid. We’ve used it a few times now for pretty big savings. Click on my link above and you’ll receive a $35 credit for your first stay and my account will also be credited. Lake Placid is a really enjoyable drive from Ottawa, less than three hours on easy-to-navigate highways with plenty of scenery. With a bit of snow on the ground by the time we got to the mountains, it was a beautiful winter scene to get us all in the mood. The Whiteface Lodge was amazing in terms of facilities. Our only problem was finding time to sit still when we weren’t swimming, skating, snowshoeing, visiting the caricature artist, watching a magic show, bowling, making smores, drinking scotch by the bonfire or playing in the games room. We’ve stayed in many hotels, but this was definitely one of the best in terms of thinking of everything that someone might need. An extra day would have been ideal but it was good to leave wanting more. Getting in the spirit of winter. 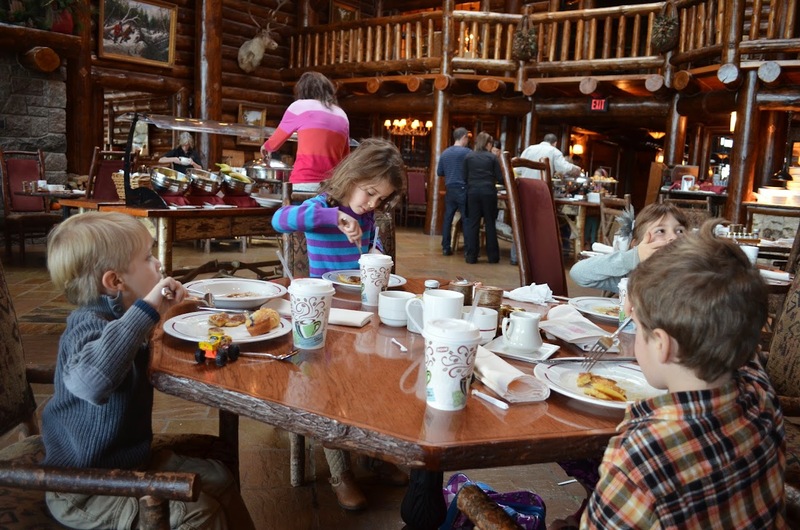 Breakfast in the lodge dining room. A hotel first, I think. The basement bowling alley! The outdoor winter pool, always my favourite. A weekend of wonderful weather (and good roads!) made this all possible. We certainly look forward to returning. I am not sure if that happens to everyone but with any family vacation of a certain length, there are some times when you think to yourself, ‘why did I make this vacation so long?’. As we left Cinque Terre, I think we all were starting to tire out a bit and look forward to our own beds. However, we knew we still had a couple of nights left so there isn’t much to do when you are across an ocean and relying on an airplane for your ride home. We debated whether we should bother stopping in Pisa on our way to Florence – it seems silly not to, the train goes right through town, but having to store our luggage and get on another train seemed a bit daunting at that time. Regardless, we decided to buck up and visit and were we ever glad that we did! Pisa seemed to re-energize everyone and set the stage for an awesome last couple of days. If you ever have the occasion to pass through Pisa, it is one of the few places where bags can still be stored at the railway station and the cost is pretty minimal. There is a nice little guide for a day-stop in Pisa that has been put together at Ready, Pack, Go that I referenced for our stop. We dropped our bags off there and then proceeded down Corso Italia, the main pedestrian mall lined with shops and restaurants that leads to the Leaning Tower. This (kind of like the Eiffel Tower) is exactly what it looks like in photos but somehow seems SO much more impressive in person. Actually appreciating how much it leans and seeing the scale of it was really much cooler than I expected. After we were done there, we wandered back through the small streets, did a little shopping on Corso Italia and headed back to the train station (and remembered to get our bags!) in time to catch our next train to Florence by 2:30. This was an awesome stopover and we were all really excited that we had done it – the kids loved seeing the Tower and Pisa has such a cool, laid-back vibe; I’d definitely consider using it as a base city next time. In Florence, we arrived at our apartment (at the top of three flights of narrow, steep stairs) and knew right away that AirBnB had delivered another great spot. Our kitchen actually overlooked the Sant’Ambrogia Market, a place we explored the next morning before taking off. We stayed east of most of the major touristy stuff, closer to the university and in a real vibrant part of town. At first, I worried that our location was too far east but now realize you could be even further east and still easily walk to everything you might want to see. One of the cool squares half a block from our place. Our first night in Florence, we went to a small pizzeria on our block, Angolo della Pizza, that was a simple affair but very delicious, and ridiculously cheap! It was cool – a complete one man operation from ordering, to preparing the pie, to cooking it right in front of us in his pizza oven that seemed to take up about a third of the floorplan of the shop. Properly satiated, we headed out on another of our night adventure walks, going from one impressive landmark to another; Basilica de Santa Croce, Palazzo Vecchio, Piazza della Republica, and finally, the Duomo that Florence is so well known for. Walking around at night, we had the streets to ourselves and it seemed even more impressive to see the monuments in the dark. One of the funnier things that happened in Florence was that the kids became obsessed with the many statues, and attempted to recreate them through their own acting while giving their own interpretation of what event was being captured. Our first night in Florence was finished up with some delicious gelato at Marco Ottaviano, a spot that was deemed the best of our trip. After being out late the night before, it was a bit of a slow start to our next day despite our big plans. We went to take the bus up to Piazzale Michelangelo for a view over the city and after finding some bus tickets, we hopped on, only validating these because the driver was nice enough to tell us how to do it. The view from the top. Piazzle Michelangelo. After enjoying the view, we hopped back on the bus to take us down to explore the south side of the river. During this trip, inspectors hopped on to check bus tickets. This already seemed a bit shady since this route is completely filled with tourists but most people managed to produce their validated tickets. The one exception was a young couple from Hong Kong who I had watched buy tickets from the driver but had failed to validate them on the bus. There was clearly no intent to scam the system, the young man, like me earlier, simply couldn’t read the instructions in Italian but in his case was given no help from the driver. He protested his case, with the inspectors and with the driver (who had sold him the ticket about three minutes earlier) but he and his girlfriend both ended up with fines for 50 euros each. I later read up on this online and I guess since about 2009 these Florence inspectors have become infamous for preying on tourists on these routes since the whole validation system is not intuitive. Ruining someone’s whole impression of a city that is now built on tourism seems to me to be a pretty short-sighted cash grab but there is really no leniency . While this was all going on, I did some online searching and also realized that perhaps our kids should have had tickets on the bus since they are over one metre tall (although the driver had told me no previously) so we quickly departed the bus at the next stop! Last day of vacation? Time for some homework. After our hasty exit, we wandered through the small streets of the South side of the Arno River, visiting some shops before eating a late lunch at Gusta Panino in front of Santo Spirito. We were unable to visit the Boboli Gardens due to some damage from rain the week before but we fought through the touristic hordes on the Ponte Vecchio and returned to our apartment for a nap before dinner. Our last night in Florence, we visited a small pasta bar where again it was a one man show, with the same gentleman taking orders, filling water, and cooking in the back. Quite fascinating to watch. We couldn’t pass up walking back to our favorite gelato spot for another treat before bed. The next morning we took a cab to the airport very early, got gouged on one final 7-euro hot chocolate for Lil’ E, and took off for home via Frankfurt. A smooth travel day that ended a wonderful vacation we’ll remember for a long time. Yep, time to head home. From Orvieto, we continued further north, passing through Perugia to our farmhouse just outside of Pierantonio where we would be staying the next five nights. This was the longest stay that we would have in one location so we were certainly hopeful that our accommodations would live up to our expectations. As soon as we stepped out of our car, took in the view and were greeted by the two dogs and David, our host, we knew they would. Casa San Gabriel was the perfect respite from a long overnight flight and three days in the busyness of Rome. We stayed in Il Fienile, the largest of their three farmhouses that are co-located on the property with their primary residence. Even on the first night, the kids couldn’t resist jumping in the pool – and so as not to sully our reputations as Canadians, we continued to go in every day, although I think most Italians probably think that the season for an outdoor pool ends before the third week of September. David and Chrissie, who own Casa San Gabriel, have a very interesting story of how they came to be there and have included some of that history on their website. Having two children of their own, they certainly knew how to set up accommodations for family travel. Even the simplest things such as having a Brio train set in our apartment provided the kids with hours of entertainment and the small playground that is set up was certainly a hit as well. The kids were able to roam the property and loved the freedom to do so. 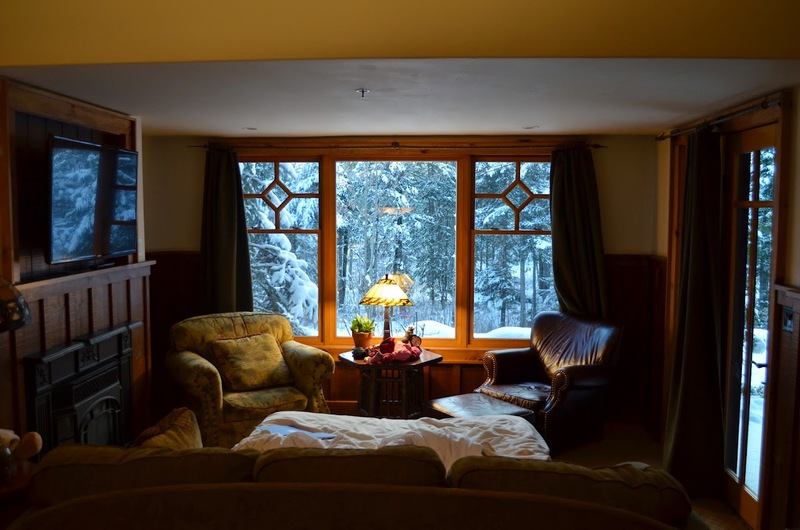 Although there are three farmhouses in relatively close proximity, as well as the family house, they are situated in such a way that our place felt completely private. Our favourite aspect was our stone terrace where we lounged about with coffee in the morning, ate every meal, and then finished the evening with whatever wine we had picked up that day. Other things we enjoyed about this stay were using the Italian bbq – stoking it with firewood and letting the hot coals do the cooking, taking a hike through the valley and the ability to visit so many interesting places that were all within a very reasonable drive. More details on these excursions coming up in a later post. The kids loved meeting and learning about the alpacas, and we all enjoyed the delicious scents of the lush gardens filled with lavender, grapes, olive trees and herbs. We enjoyed our accommodations everywhere in Italy, but it would be hard to say that this wasn’t our favourite. It really had everything we were looking for: the tranquility of the Italian countryside, lots of things to keep the kids entertained, and all the comforts of home, but with a better view!